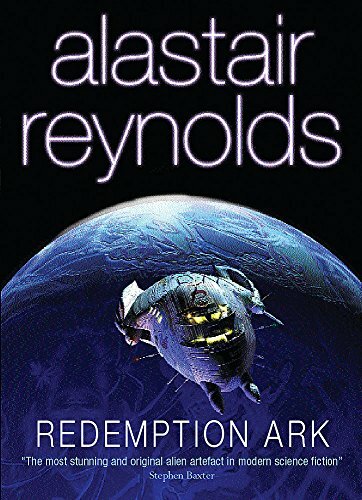 The most important thing to know about Alastair Reynolds’ Redemption Ark is that it is a middle volume of an ongoing series. Probably, it is best viewed as the central novel of an Inhibitor Trilogy, whose first volume was Revelation Space and whose last will, presumably, be the forthcoming Absolution Gap. There are also, however, less important links to Chasm City and a number of Reynolds’ short stories. Those who don’t know this will find themselves provided with a beginning of sorts but not much of an ending - that will come, on an epic scale, in the third part of the trilogy. In any case, Redemption Ark, like its predecessors, is also gloriously its own story. We stand at the end of one war but at the beginning of a greater one. In the Yellowstone system, the neurally interlinked Conjoiners are about to defeat their Demarchist enemies. The Conjoiners, though, have discovered a much more deadly threat both to themselves and to all of humanity: one of their interstellar expeditions has been all but annihilated by the implacably hostile machine civilisation that they are soon calling the Wolves. The only hope against this new foe is to recover a cache of stolen prototype superweapons currently controlled by Triumvir Volyova in the Resurgam system. The Conjoiner selected to lead the recovery expedition, Nevil Clavain, first attempts to defect to the Demarchists and then launches his own expedition to claim the weapons on behalf of all the human factions. There follows a relativistic chase as Clavain’s stolen lighthugger and a Conjoiner ship race across interstellar space towards Delta Pavonis, Resurgam’s star. Volyova, however, has her own urgent plans for the weapons: the Inhibitors awakened by Resurgam’s colonists have begun to disassemble worlds, and their aim is nothing less than the total extinction of humankind. For space opera fans, this is, needless to say, excellent stuff; and there is every sign that it’s only the beginning of an even vaster story. With each novel, Reynolds grows markedly in assurance. Indeed, it seems only a matter of time before he produces a true masterpiece.